VOSD is gradually marching forward to achieve its set goals and objectives benefiting the poverty-stricken and disadvantaged people, especially the women and the children of the community. It has been awarded the project named “Command Area Development (CAD) Part-C, Small Scale Fisheries Development in Matlab Upazila (Meghna-Donagoda) from December 1999. VOSD has been implementing the above mentioned project in Matlab Upazila of Chandpur District with the financial support of Department of Fisheries (DoF) and Asian Development Bank (ADB). The successful and effective implementation of the project has benefited a good number of targeted women group members in the project areas and many of them have become self-reliant and have been culturing fish with their own fund, because some of them have raised own fund from their income from the fish culture and continuing fish culture. It is mentionable here that many community people, being interested by seeing the successes of the beneficiaries from cultured fishes in the fallow ponds and earning incomes from the modern and scientific fish culture, which has created employment opportunities, income earning opportunities and resource utilization opportunities in the project with modern and scientific fish culture, which have been enhancing national nutrition status, protein intakes, national incomes, national employment status and creating positive impact on the national GDP. This project has covered small ponds and irrigation canals of 77 villages of 14 Unions in Matlab North Upazila under Chandpur district. The main activities of the project are motivation and awareness raising, fish farmers’ groups’ formation, fish cultivable ponds and canals identification and selection, credit support for fish culture and production. All the project activities have been implemented with the consultation of DoF personnel. To improve the economic conditions of poor people or poverty alleviation, it is needed to create employment and income generating opportunities for poor people, so that they can improve their economic conditions and increase purchasing capacity. The project had provision to provide credit support to the organized and trained fish farmers. Tk 87,50,000/- credit fund has been utilized properly in the first phase and in the second phase, same amount of credit has been approved by the DOF/ADB/BWDB, which are being utilized among the fish farmers. Credit rules and regulations of the DOF were followed up during loan distribution. 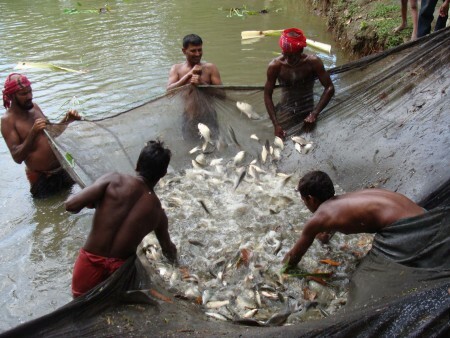 The disbursed amount has been used for fish culture in 720 ponds of 250 hectors. VOSD has been given loans as inputs to the members. The staffs have been regularly visiting the fish ponds and discussed how to grow more fishes. The group members, who have got credit, have been cultivating fish in their ponds.